I've been looking for a good breed of dog to go with me on my hiking backpacking trips. These trips usually involve many hours of walking over difficult terrain, going up and down Mtns, across streams and rocks etc. Now, the dog I would take would not only have to be able to handle this stress, but I would also like for it to be off the leash so I have my hands free to do other things, and so it could roam around the campsite and surrounding area without me having to worry about it too much while setting up tent. 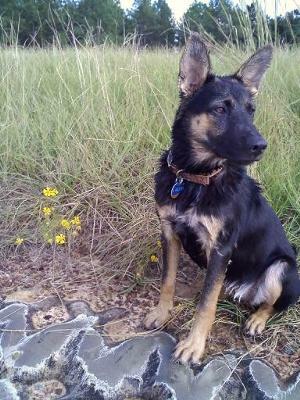 German Shepherds are agile and energetic, so I think that fills the first criteria, but I have heard that it is not smart to let them off the leash. Would that apply in my situation?? Hey Robert, a German Shepherd could make an excellent hiking companion under the right conditions. They are very athletic, tremendously intelligent and do love to do things with their masters such as running, walking and hiking. And like any athlete, you would have to build your dog up to the kind of athletic stress you've described to prevent a lot of injury. Plus, and I can't stress this enough, you would seriously need to train your dog, no matter if its a GSD or not, so that you can be assured that it obeys your every command - because you never know what you're going to come across in the great outdoors. And I have to admit, the off leash thing does scare me a lot in the great outdoors but if your dog is a super well trained dog then this might be okay. You would just have to know your dog really well, how well it obeys you and be super observant to its body language in all its surroundings. So, yes, A GSD could make a great hiking companion but there are a few things you'd need to do first to make the dog truly "trail worthy" (as we discussed above). Good luck - and send us some pictures when you go!